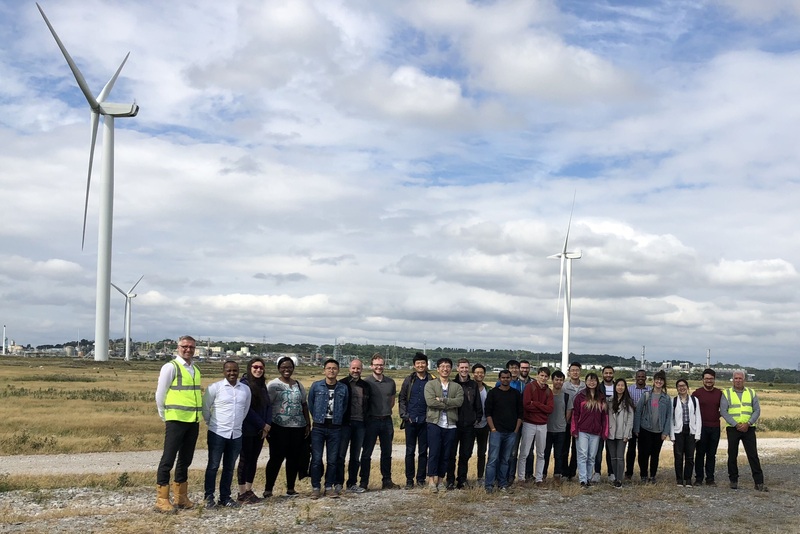 The IEEE Power and Energy Society Student Branch Chapter University of Manchester organised a site visit to Peel Energy Wind Farm, Frodsham. The event was FREE with transportation included. Peel Energy wind farm is a large wind generation site near Frodsham. It has more than 50 MW installed capacity and delivers at over 97% availability. For more information, please visit here. Please also check the latest news here. The tour was split into two parts. During the first part, Michael, Jonathan and Richard gave a 15-minute presentation providing useful information and their insights regarding the planning and the operation of the wind farm. Specifically, they elaborated on the whole planning process from the first initial feasibility study that took place on 2009 aiming at evaluating the wind energy resource on the site until the moment that the wind farm became operational in February 2017. Details were also provided regarding Nordex, the wind turbine supplier and the topology of the wind farm, which is split into two different clusters of wind turbines, each served by its own sub-station connected to distribution level. This was followed by questions from the audience regarding the process of the public inquiry, the design life of the wind farm, the way that the wind farm is monitored and the existing protection mechanisms, its profitability along with the existing subsidy scheme etc. All questions were answered with great detail and in a timely manner! During the second part, the participants were moved on the outer area of the wind farm. First, they stopped on the western cluster which comprises of 13 turbines and is located to the immediate north of the village of Helsby. Then, they were moved to the eastern cluster consisting of 6 turbines and located to the immediate north of the village of Frodsham. The whole operation team of the wind farm stayed there as well to provide more information and to answer further questions. Many thanks once again to Michael, Jonathan and Richard for all the useful information provided! Thanks also everyone for attending the site visit! For those who could not make it, keep watching our website and social media for upcoming events!